An olive oil unique to its production area in Valencia, this extra virgin olive oil is a special blend of 60% Picual, 20% Arbequina, and 20% Genovesa, Blanqueta and Alfafarenca, native to the area. The aroma is fresh, elegant and balanced with pronounced notes freshly cut grass with fruity notes of green banana, prunes, and green almonds. Its taste is sweet and dense, with a delightful balance of spiciness and bitterness with notes of citric fruit, green banana, artichoke and tomato. The "High Quality" oil by Masia el Altet is also a favorite by French Chef Joël Robuchon whose restaurants have amassed 28 Michelin Stars over the years. Pressed from a blend of organic Spanish olives. 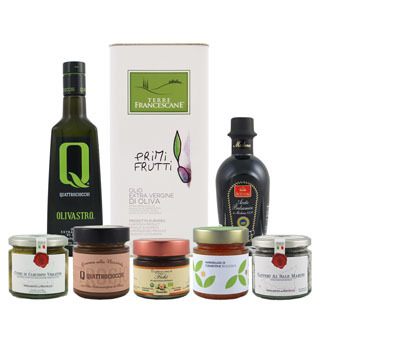 Award winning oil rated "Best Olive Oil in the World." Great gift! PDO Kolymvari Extra Virgin Olive Oil from Western Crete.